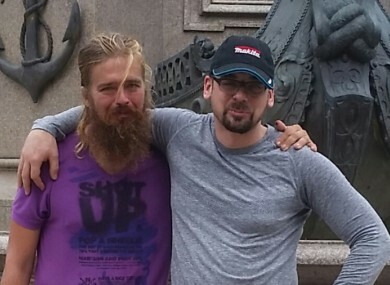 Anton Pilipa (L) has been reunited with his brother, Stefan. A 39-YEAR-OLD Canadian man who disappeared in 2012 has been found safe and sound near the Amazon jungle in Brazil. Anton Pilipa was found on a motorway near the city of Manaus in November, and has now returned home to his family in Toronto. Pilipa, who is described by his brother as having suffered through a “prolonged struggle with mental health illness”, made it home after a GoFundMe campaign raised enough money to get him home. He was found by Brazilian highway police but Pilipa could not speak Portuguese and the authorities had trouble identifying who he was. Helenice Vidigal, a Canadian-born Brazilian officer, overheard Pilipa speaking and managed to get the ball rolling to track down his family. She outlined in a Facebook post how she managed to track down who Pilipa was, and how he made it home. She began by posting a picture of Pilipa on Facebook and contacted the Canadian embassy in Brazil. Since he hadn’t committed a crime, Pilipa was released by police and sent to hospital. He then ran away from that hospital on 8 December and wasn’t found again until 3 January, when police tracked him down on the edge of the jungle. In the meantime, Pilipa had been identified and his brother, Stefan, had been contacted in Toronto. A GoFundMe page was set up to try and get Pilipa home and managed to exceed its goal of $8,000 and raised $12,849. The family have no idea how Pilipa made it to Brazil, but are delighted he has been found safe and sound after being missing for almost half a decade. Now he’s back home in Toronto, the family plan to simply “hold him close”, according to Stefan. They will get Pilipa a “place to live and some treatment” to “help him have the life he deserves”. Email “Missing Canadian man found near Amazon jungle after 5 years reunited with family”. Feedback on “Missing Canadian man found near Amazon jungle after 5 years reunited with family”.